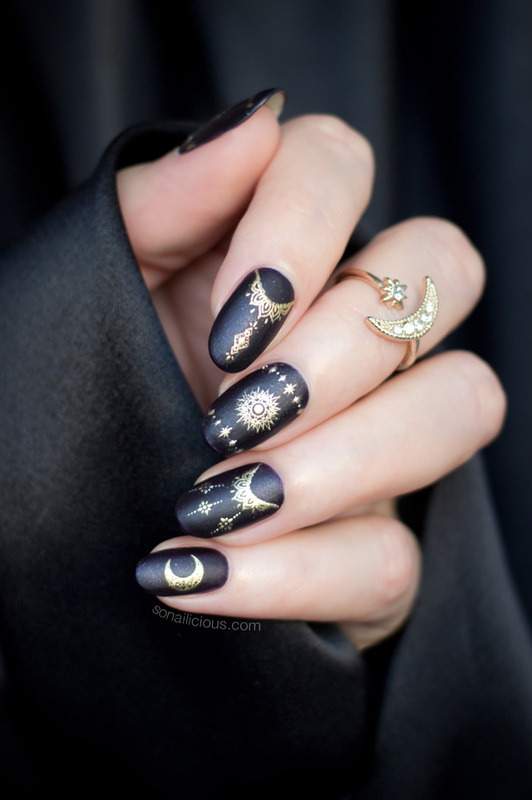 If you’re into elegant manicures, this black and gold design is perfect for you this Halloween and… bonus, they are very easy to do. Of course, they are not just for Halloween, you can wear them well beyond it. As much as I like a good Halloween costume I’ll never reach Heidi Klum-levels of dedication. 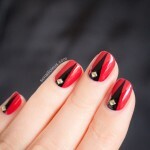 Halloween nail art however, is a must. Each year I try to come up with an original design. There were Pumpkins, Spider Webs, Maleficent nails, elegant Halloween nails and even cute Halloween nails. 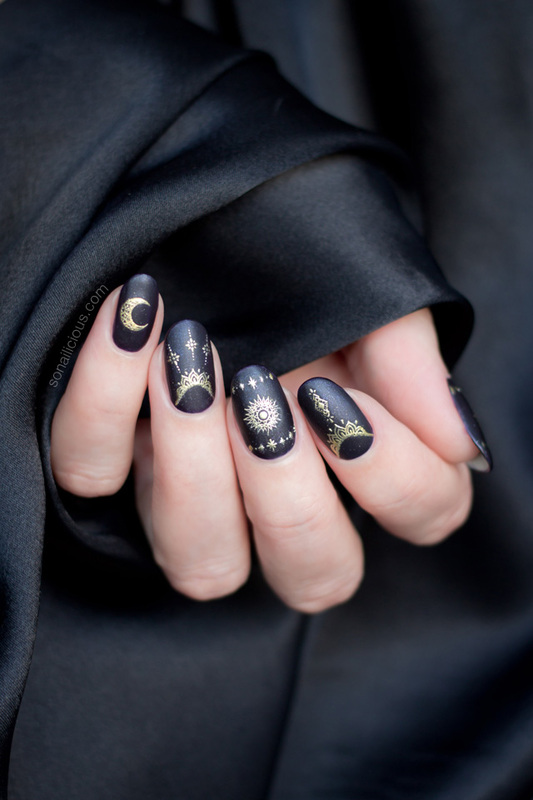 This year is devoted to Magic nails in honour the ancient Celtic festival Samhain, from which Halloween originates. 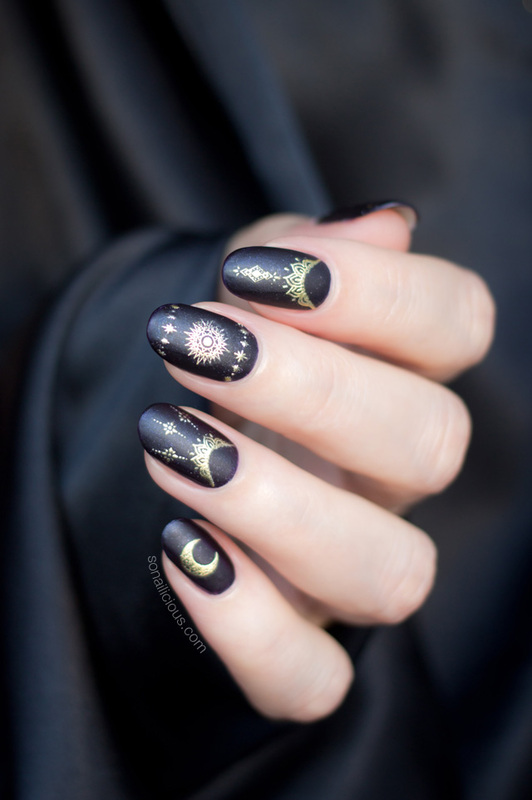 HOW TO: Start with a protective base coat, add 2-3 coats of a black purple polish then apply gold stickers (here’s my best tips on how to apply nail stickers flawlessly). Seal with a matte top coat and you’re done. How easy is that? 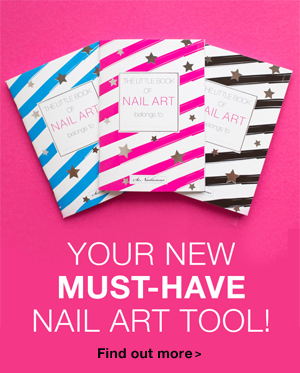 These Magic nails are literally, magic! They are so versatile and will look fabulous in almost any colour. 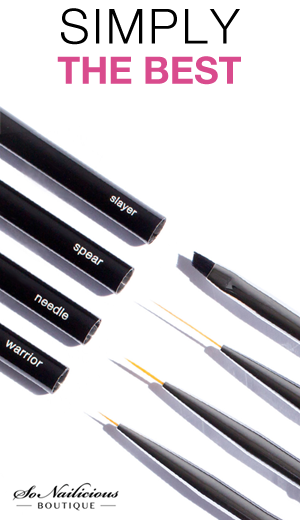 So if you’re not a fan of black, there are plenty of other options. You can even adopt this nail design for summer or spring, just use pastel colours for your base. So, will you give it a go – for Halloween, or beyond it?